We’re in the home stretch, the last autumn cooking through Around My French Table, so we’re making sure to cover the recipes with seasonal ingredients that won’t be available as the rest of the year unfolds. Somehow we skipped Jerusalem artichokes the last three autumns of French Fridays with Dorie, so now we have to make up for that oversight. A few weeks ago, Jerusalem artichokes made their debut appearance when we roasted them with garlic. This week, they are the star of a simple velvety soup. Same nutty vegetable, two completely different textures. And learning from round one, I knew to pick tubers that had fewer warts and knobs for ease of peeling. 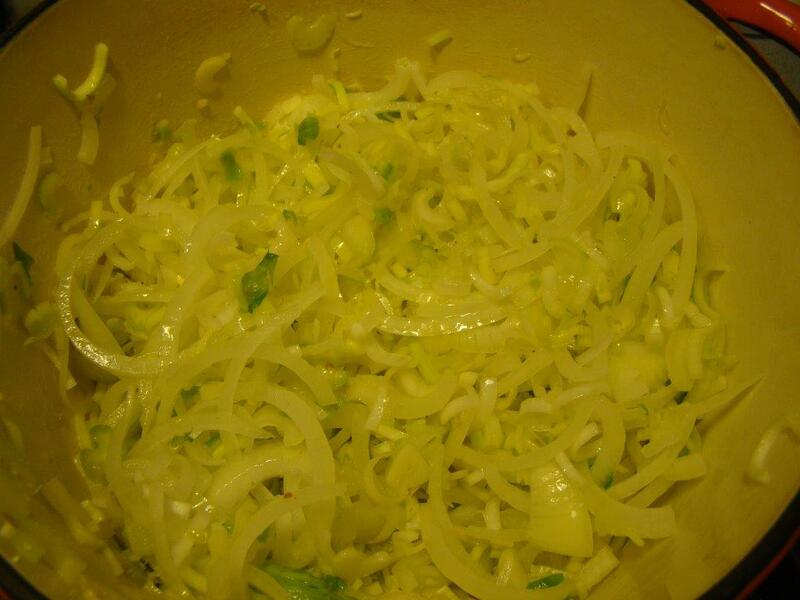 The soup starts off by sautéing a pile of ivory and pale green vegetables (onions, garlic, leek and celery) in butter. Once the vegetables are soft, chunks of Jerusalem artichokes get added and sautéed some more. The chokes were supposed to soften after 15 minutes before the chicken broth gets added. Mine were not soft, but I assumed the long simmer in broth that followed would fully cook them. I was right. The final step is to process the soup in the blender for a smooth puree. Not surprisingly, all those white vegetables result in a bland looking bowl. Parsley coulis adds color to the bowl. 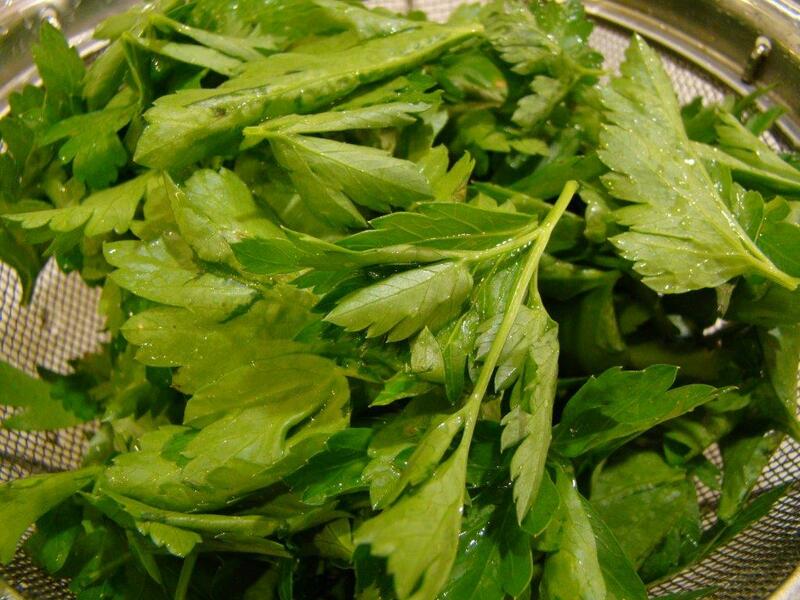 Parsley leaves are quickly blanched then cooled in ice water, drained and patted dry. 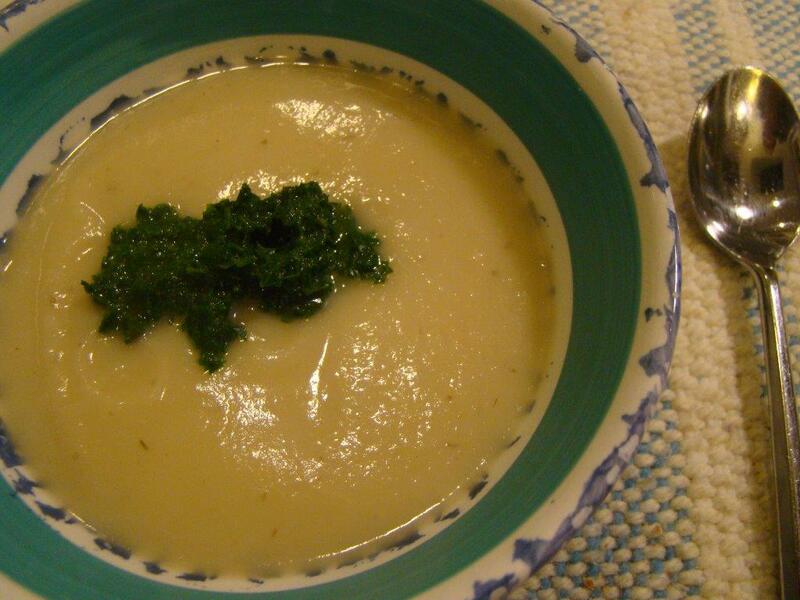 To make coulis, the parsley is pureed with olive oil. I must have packed my parsley leaves more than I should have. My coulis was thick and chunky, even after I added extra oil. It was more like pesto without nuts or cheese, rather than something that would drizzle. It didn’t look as pretty as it might have, though it tasted just fine. This soup is light enough for a starter for dinner, which is how I served it. With crusty bread or crackers, it would also make a nice lunch. I still think it’s not worth it to seek out Jerusalem artichokes, but if you have a ready source, this soup is lovely. If you want to check out the other Doristas’s soup bowls, you can follow their links from here. The recipe can be found in Dorie Greenspan’s book Around My French Table or on Google Books.